I was really blown away by this collection from Apex Publishing. It's not often that I come across a collection like this where each story is superb. This is horror fiction at its finest, which isn't surprising as his work has appeared in Cemetery Dance, Black Static, The Dark, Shadows and Tall Trees, Nightscript, Shock Totem and Gamut (plus many more.) He also received a Shirley Jackson nomination for his debut collection; Greener Pastures. I was a couple of paragraphs into the first story, Beside Me Singing In The Wilderness, when I realised this was a really special book. "I've come home to this nameless mountain pouring blood from it's bowel." It actually took me a really long time to read this as I almost didn't want it to end. This collection is one of those books that you will want to read over and over. Firstly for the enjoyment of outstanding horror and secondly to try and find out how Michael Wehunt spell binds his readers to the page. I really liked his signature style of writing, its very visual and I felt like I was watching his stories rather than reading them - pure genius! Each story is very different in regards to its themes, style of horror and tone. Some are really moving particularly Devil Under The Maison Blue and The Dancers and others really creepy! 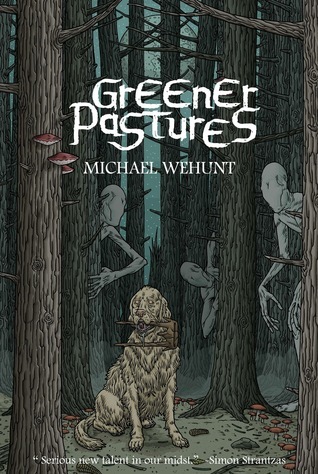 Greener Pastures really scared me and its not often that fiction really scares me unless I'm reading Adam Neville. My stand out favourites include; Beside Me Singing In The Wilderness, Greener Pastures, The Devil Under The Maison Blue, Deducted From Your Share in Paradise and Dancers. In the future I am definitely going to keep an eye out for more stories by Michael Wehunt I can sink my teeth into, and fingers crossed for a second collection of horror!